Every year, Dunedin Marine Search and Rescue requires approximately $30,000 to ensure we can continue to provide life saving services in the Otago marine environment. Specialised rescue and personal protective equipment including rescue harnesses, wet suits, personal locator beacons, safety helmets, swim fins, radio communications etc. Administration costs including post box fee, printing, stationary, and computer fees, accounting/auditor fees etc. Dunedin Marine SAR relies on the generosity of individuals and businesses to fund our essential services. We need your help to continue to provide this vital life saving service in and around Otago. We are constantly asking for donations and looking for corporate sponsorship. Please donate via our Give a Little page today. If you wish to become an official Dunedin MSAR sponsor please contact us now. 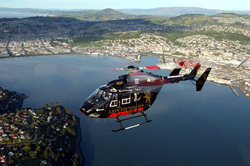 ﻿Dunedin Marine SAR is very fortunate to have the support of Helicopters Otago and the Otago Rescue Helicopter Trust. They donate a significant amount of money and time towards crew resource management training, winching and helicopter safety training plus helicopter flight time for in-air training.